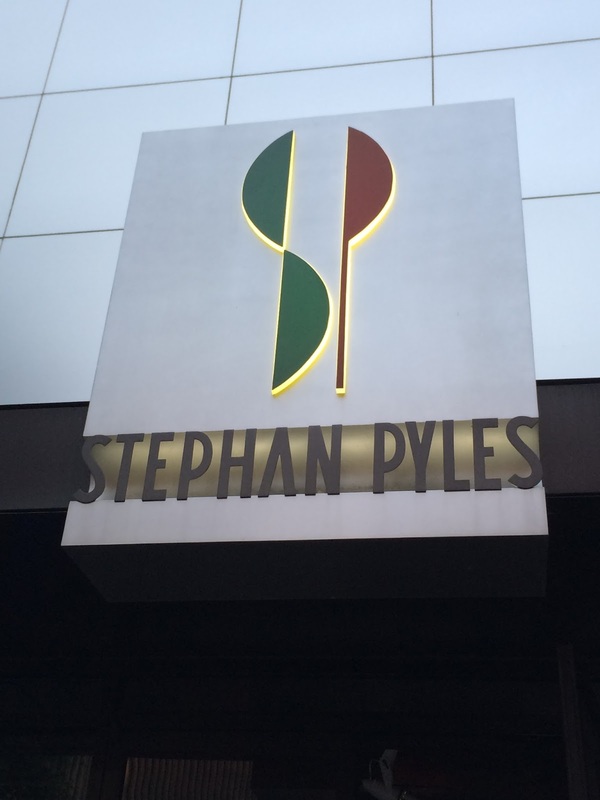 After April 30th Stephan Pyles, iconic and namesake restaurant has closed to reopen its doors as a new restaurant concept, Stephan Pyles Flora Street Cafe. This is not Chef Stephan Pyles first successful restaurant to close, in fact his other iconic restaurants that gained him stardom were: Routh Street Cafe, Baby Routh, Star Canyon, AquaKnox, Samar, San Salvje and now of course Stephan Pyles. Within those restaurants some of his famous dishes have carried through to his namesake restaurant and will still carry on to either in the new restaurant concept or his sustaining restaurant, Stampede 66. The famous dishes that have survived different restaurants are the bone-in cowboy ribeye, Southwestern Caesar Salad and Nueva Heaven and Hell. Stephan Pyles is what I like to call, Dallas’ Davey Crockett. Why? 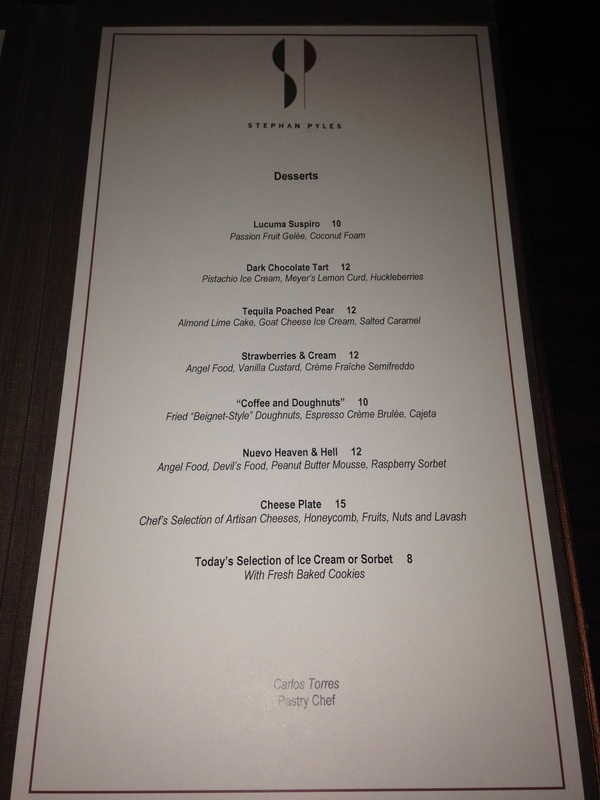 Because Chef Stephan is a pioneer in the Dallas culinary scene. He defined Texas cuisine and along side his fellow colleague, Chef Dean Ferring, they became the founding fathers of Southwestern Cuisine. During his tenure Chef Stephan has won several awards, including the prestigious James Beard award for Best Chef – the first chef to win from the Southwest. He was also awarded in 1985 for the James Beard Who’s Who of Food and Beverage which represents chefs that are the most accomplished in their profession. Along with his awards he has also been nominated in different James Beard categories: Best New Restaurant for Star Canyon in 1995, Outstanding Chef for Routh Street Cafe in 1992, and the more recent nominations for Outstanding Chef for Stephan Pyles Restaurant in both 2012 and 2013. 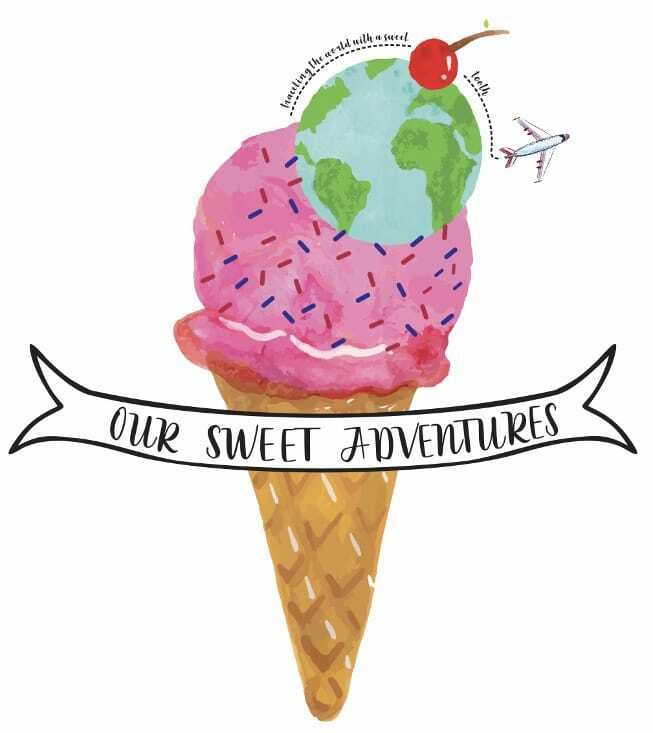 As a chef he has also been notably recognized by Dallas Morning News, Bon Appetit, Food and Wine and more. 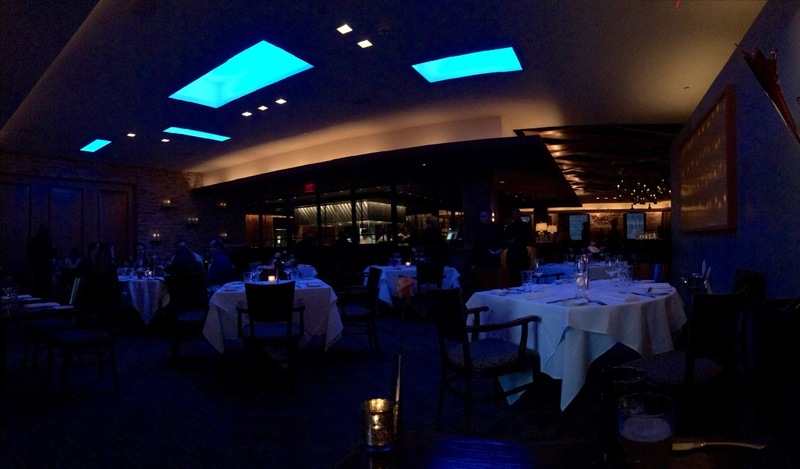 His restaurant, Stephan Pyles has been one of the top rated restaurants in Dallas according to Eater, D magazine, Zagat and more. It is safe to say that yes this man is a culinary icon and I feel honored to have been able to dine at his namesake restaurant before its closure. This is Stephan Pyles famous dessert which I believe dates back to Star Canyon. This is one of his dishes that will always carry on in some shape or form at his existing and/or future restaurants. This dessert sure enough was as good as its reputation. The only flaw – the chocolate coating, but I will get to that later. It is called heaven and hell for a good reason – a thin bottom layer of devils food cake while the top layer is angel food cake with a thick layer of peanut butter mousse in between the cakes serving as the “purgatory”. Both cakes were baked to perfection – nice and spongy just one was richer than the other obviously the one from “hell”. The angel food cake or “heaven” delivered a lighter and more delicate tone that balanced the richness from the devils food cake and peanut butter mousse. All layers stayed well intact after every slice – always a pleasant sign because pretty layers in a cake means nothing if the cake just falls apart when you try to take a slice. The peanut butter mousse was decadent and had an excellent mouthfeel, dense yet smooth at the same time. Definitely got a lot of peanut butter flavor and it paired well with both the devils food and angel food cake. The last main component of this dessert was a raspberry sorbet. As stated before this dessert is quite rich and the fresh raspberry sorbet balances the richness out with its refreshing sweet tartness. The sorbet sits on some peanut powder that dissolves in your mouth and has a shard of chocolate nib tuile placed on top for a little crisp of texture. The only flaw was the milk chocolate ganache that is encased in the layered cake – it was sticky and would separate from the cake itself. Nevertheless this dessert is a piece of heaven and maybe a little bit of hell from all the calories. 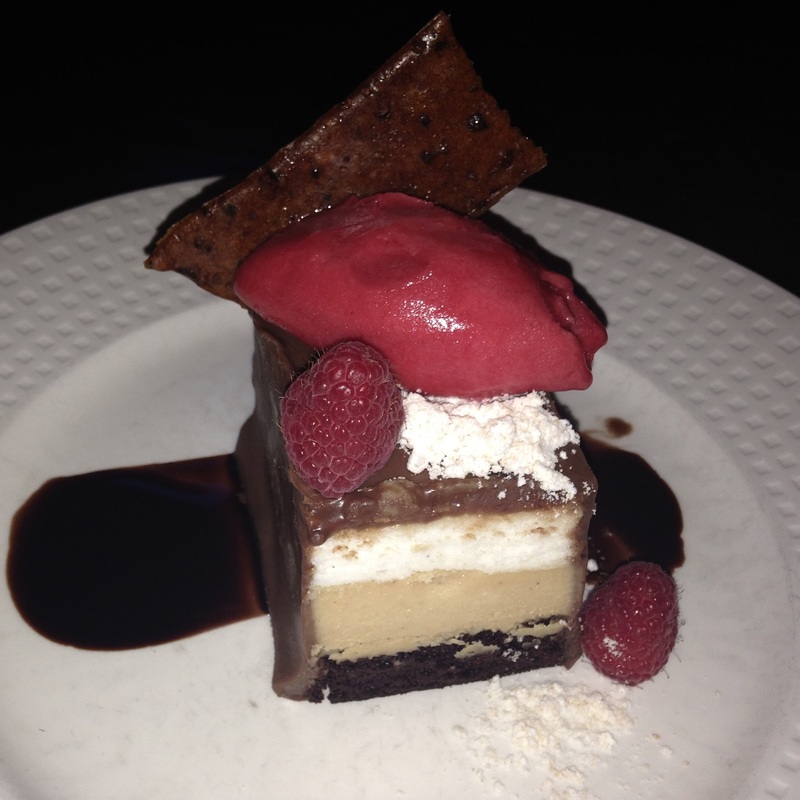 This dessert was featured on Zagat as one of Dallas’ best chocolate desserts and they were absolutely right! This dessert is was amazing – beautiful presentation and beautiful flavors. 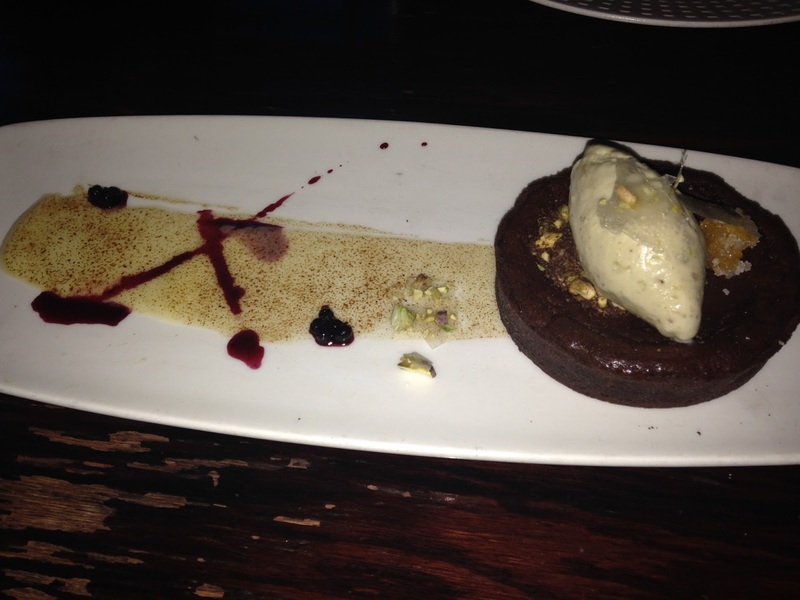 This dessert was a dark chocolate tart with a Meyer’s lemon curd, huckleberry sauce, and pistachio ice cream. Rich, decadent, dark chocolate that was almost bitter. It had a crunchy crust with a soft ganache in the inside. Already a great start of bringing out a contrast of textures. Adjacent to the chocolate tart was a smear of Meyer’s lemon curd that seemed to be torched awarding it an elegant look and taste – it was tangy and divine. The huckleberry sauce was sweet and slightly tart and gave the dessert an artistic touch of a blue-purple color and flare. Underneath the pistachio ice cream was some pistachio crumble offering both security to the ice cream and more crunchy texture. The pistachio ice cream itself was wonderful and tasted like raw pistachios straight from the shell – it was sweet but not artificial. Lastly, pieces of lemon glass shattered on top of the pistachio ice cream and chocolate tart that added just another touch of excellence. This plated dessert had the perfect amount of every component to compliment the rich, dark chocolate tart. It was like an orchestra every little component coming together to make the perfect harmony!